I love and am loved through the sorting, spraying, washing, drying, folding. The day in, day out task that is never done, but needs done anyway. This nagging aggravation, this blessed gift. The piles shout, the tangle of pants, shirts, fabric napkins and socks themselves evidence of provision, play. From the linoleum floor, dirt and stains call from whence they came — the soccer game, knees in backyard dirt, meal slurped, life grabbed by horns. On Fridays, she comes. My mother-in-law with the beautiful olive skin and salt and pepper hair. The spunky woman less than 5 feet who raised four boys into adulthood and knows her way around a laundry room. While I work at the office, she prepares loads and suds, times other activities so she can fold and place clothes in drawers. Never asking thanks or attaching strings, simply seeing and doing the part she chooses in this family task that never ends. Every week, Mom blesses as she notices and remembers the chaos of early days and all the piles. She digs hands right into our mess mounds and places armfuls in the machine where clean water courses through the fibers of lives lived. Joining today with Five Minute Friday at Lisa-Jo Baker’s where this week readers raised $5,000 in less than 12 hours for a community water and laundry project in South Africa! Such good news. I need to be reminded that something so automatic for most of us as the washing and drying of clothing is, for many, anything but simple. Today’s prompt was LAUNDRY. This is Day 18 of Right Here. Throughout October, I’m joining with a community of bloggers (over 1,500 strong with The Nester), in which writers post each day in exploration of the same topic. 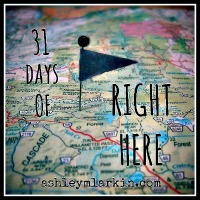 To find all posts in my 31 Days of Right Here, click here, or see the listing below. How I love the way you use opposites to tell the story that is such an integral part of everyday life. I am sure you mom-in-law knows how to do laundry after four boys. This is one activity I cannot do anymore with my illness but I am so blessed by a wonderful lady who works for us twice a week to do all these tasks I am unable to do! That’s lots of dirty socks, isn’t it, Mia? I am glad you have the help, dear friend. Praying for you today. Ashley, I loved this. Your mother-in-law “simply seeing and doing the part she chooses in this family task that never ends.” What a blessing. What a lady. Makes me want to hug her and say “thanks for seeing and being a part” even though she’s yours. :) You write beautifully, too. “Thanks for seeing and being a part.” I love how you said that, Dana. Happy for your blessing of a MIL who chooses to remember how hard it was for her too, and so helps out now. I have such a MIL. Enjoy your workday and weekend. You do, too? Oh, I’m so happy for that for you, Leah. Laundry! What a beautiful means of telling what life is going on, right here. Both metaphor and ever-present reality. Your mother-in-law is one of those blessed rare people whose beautiful hearts pour out in quiet service. Clear flowing streams of love. What a lovely lovely woman. What a beautiful act of love on your mother in law’s part!! Loving right here is hard for me sometimes. I totally admire this series plus totally admire that you’ve actually posted every single day! That’s a win right there! Thank you, Kim. I relate: “Loving right here is hard for me sometimes.” Yeah, sometimes I want to do the grand gestures and skip the everyday stuff, but what love’s spoken to me in those everyday acts of love. Thanks for your presence here. that’s a beautiful gift to have a mother in law like that! I love, love that she serves and loves you and your family that way. Put a smile on this girl’s face! 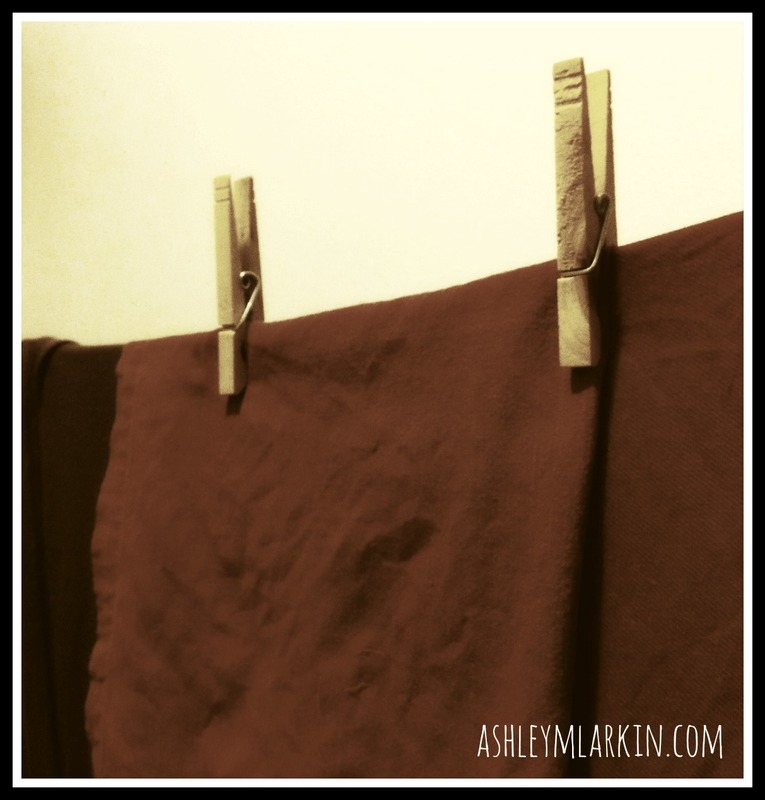 So you’ve learned/are learning to make laundry your love language? This line is awesome, Elizabeth. Seems like a poem in the making: “Laundry is an archival indicator of the gut and glory of real living.” And “husband’s happy meter.” That made me smile. You mother in law sounds like my mom. Laundry is totally her thing. Laundry as love language. Sometimes I wish it were mine. I love this! And oh what a gift! It reminded me of when my own machine was not working last year for only a week or so but I would take my laundry to my Mom’s… and by the time I went back to switch it over – she had already dried it and folded it for me! Oh such joy… and what a glorious feeling of being taken care of! We just never ever outgrow that! Love you, friend! Ashley, I feel like I’m in your house with you and your mother in law. I was surprised how much I loved the laundry prompt, indeed a mark of ordinary, messy, abundant,living. What a beautiful tribute to your truly special & sacrificial mother-in-law! I’m thankful God has blessed you with her in your life. Your heart and hers, full of love.